Numeral systems are classified here as to whether they use positional notation (also known as place-value notation), and further categorized by radix or base. A binary clock might use LEDs to express binary values. In this clock, each column of LEDs shows a binary-coded decimal numeral of the traditional sexagesimal time. The common names are derived somewhat arbitrarily from a mix of Latin and Greek, in some cases including roots from both languages within a single name. There have been some proposals for standardisation. 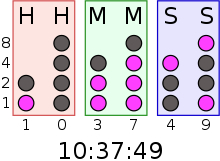 27 Heptavigesimal Telefol and Oksapmin languages. Mapping the nonzero digits to the alphabet and zero to the space is occasionally used to provide checksums for alphabetic data such as personal names, to provide a concise encoding of alphabetic strings, or as the basis for a form of gematria. 40 Quadragesimal DEC Radix-50₈ encoding used to compactly represent file names and other symbols on Digital Equipment Corporation computers. The character set is a subset of ASCII consisting of space, upper case letters, the punctuation marks “$”, “.”, and “%”, and the numerals. 64 Tetrasexagesimal Base64 encoding; I Ching in China. This system is conveniently coded into ASCII by using the 26 letters of the Latin alphabet in both upper and lower case (52 total) plus 10 numerals (62 total) and then adding two special characters (for example, YouTube video codes use the hyphen and underscore characters, - and _ to total 64). 85 Pentoctogesimal Ascii85 encoding. This is the minimum number of characters needed to encode a 32 bit number into 5 printable characters in a process similar to MIME-64 encoding, since 855 is only slightly bigger than 232. Such method is 6.7% more efficient than MIME-64 which encodes a 24 bit number into 4 printable characters. 90 Nonagesimal Related to Goormaghtigh conjecture for the generalized repunit numbers. 91 Unnonagesimal Base91 encoding, using all ASCII except "-" (0x2D), "\" (0x5C), and "'" (0x27); one variant uses "\" (0x5C) in place of """ (0x22). 92 Duononagesimal Base92 encoding, using all of ASCII except for "`" (0x60) and """ (0x22) due to confusability. 93 Trinonagesimal Base93 encoding, using all of ASCII printable characters except for "," (0x27) and "-" (0x3D) as well as the Space character. "," is reserved for delimiter and "-" is reserved for negation. 94 Tetranonagesimal Base94 encoding, using all of ASCII printable characters. 95 Pentanonagesimal Base95 encoding, a variant of Base94 with the addition of the Space character. 26 Bijective base-26 Spreadsheet column numeration. Also used by John Nash as part of his obsession with numerology and the uncovering of "hidden" messages. All known numeral systems developed before the Babylonian numerals are non-positional,, as are many developed later, such as the Roman numerals. ^ Everson, Michael (2007-07-25). "Proposal to add two numbers for the Phoenician script" (PDF). UTC Document Register. L2/07-206 (WG2 N3284): Unicode Consortium. ^ Cajori, Florian (Sep 1928). A History Of Mathematical Notations Vol I. The Open Court Company. p. 18. Retrieved 5 June 2017. ^ Chrisomalis, Stephen (2010). Numerical Notation: A Comparative History. Cambridge University Press. p. 200. ISBN 9780521878180. ^ "Burmese/Myanmar script and pronunciation". Omniglot. Retrieved 5 June 2017. ^ For the mixed roots of the word "hexadecimal", see Epp, Susanna (2010), Discrete Mathematics with Applications (4th ed. ), Cengage Learning, p. 91, ISBN 9781133168669 . ^ The History of Arithmetic, Louis Charles Karpinski, 200pp, Rand McNally & Company, 1925. ^ Histoire universelle des chiffres, Georges Ifrah, Robert Laffont, 1994. ^ Grannis, Shaun J.; Overhage, J. Marc; McDonald, Clement J. (2002), "Analysis of identifier performance using a deterministic linkage algorithm", Proceedings. AMIA Symposium: 305–309, PMC 2244404, PMID 12463836 . ^ Stephens, Kenneth Rod (1996), Visual Basic Algorithms: A Developer's Sourcebook of Ready-to-run Code, Wiley, p. 215, ISBN 9780471134183 . ^ Sallows, Lee (1993), "Base 27: the key to a new gematria", Word Ways, 26 (2): 67–77 . ^ "base95 Numeric System". Retrieved 2016-01-03. ^ Nasar, Sylvia (2001). A Beautiful Mind. Simon and Schuster. pp. 333–6. ISBN 0-7432-2457-4. ^ Chrisomalis calls the Babylonian system "the first positional system ever" in Chrisomalis, Stephen (2010), Numerical Notation: A Comparative History, Cambridge University Press, p. 254, ISBN 9781139485333 .